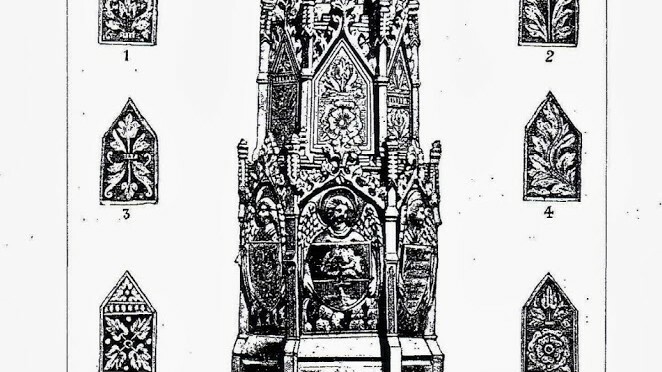 This engraving from Brook’s 1892 article in PSAS about the medieval Scottish university maces shows the head of the Glasgow mace, which was made in Scotland in the 1460s. When I was in the exhibition in MUSA looking at this mace, I was struck by the foliage designs on the panels in the central stage (these six panels are illustrated on the engraving). The leaves on these lovely engraved silver plates are similar to the late 15th century forepillar leaves on the Queen Mary harp, However the leaves on the mace are not identical, and to me they looked a bit later. There are similar leaves on the 16th century Ballinderry harp metalwork. 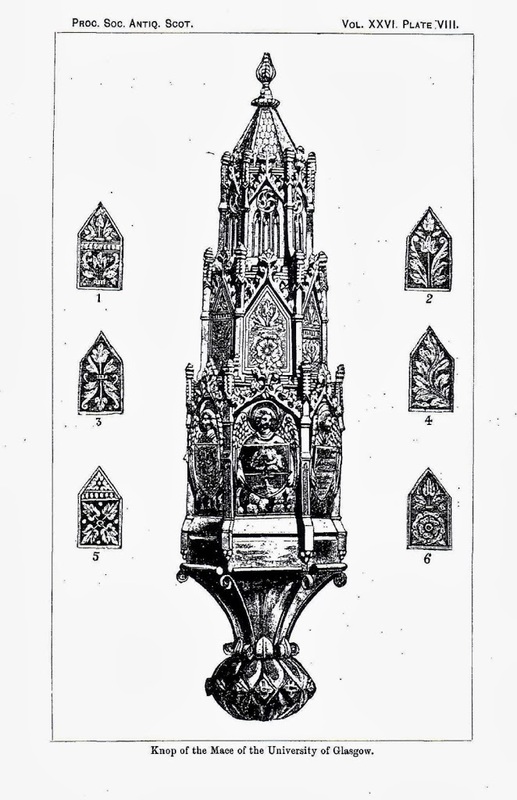 Brook suggests that the plates are not original to the 1460s construction of the mace, but may have been late 16th century post-reformation replacements of figures of saints. 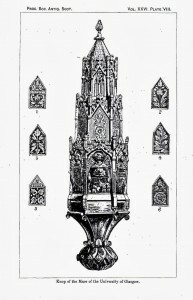 The St Andrews Arts mace and Canon law mace both have very similar designs and both have saints in these middle panels. The leaves are not easy to see on the mace in the museum as they are above eye level and the silver is very highly polished. However I am looking forward to comparing them with the leaves on my replica of the Queen Mary harp at my concert tomorrow.